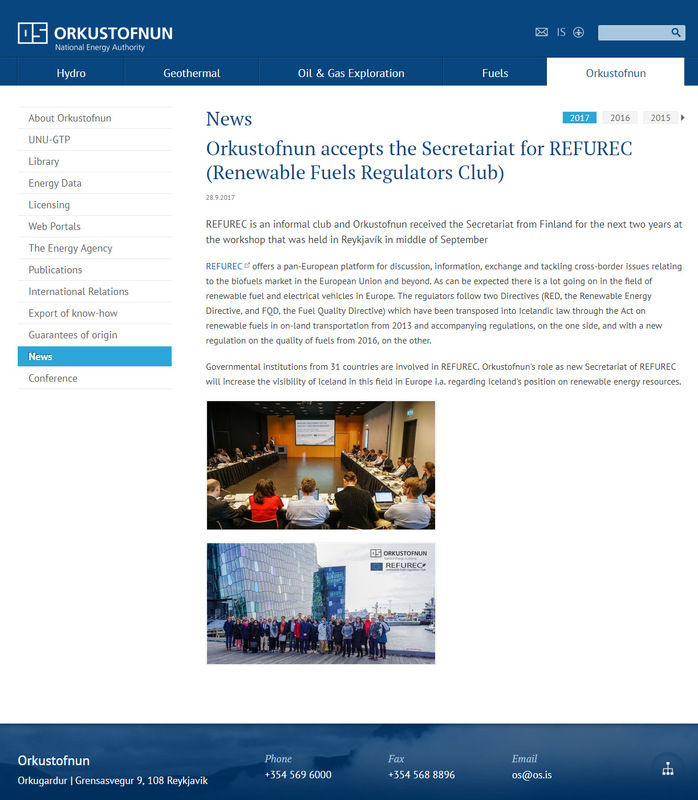 At our recent workshop in Iceland, we have successfully transferred the REFUREC Secretariat to Orkustofnun, Iceland’s National Energy Authority. For the next two years, Iceland will co-ordinate the Secretariat in order to maintain and develop our initiative. We look forward to continue building a successful platform for confidential dialogue, information exchange and tackling cross-border issues relating to biofuels markets in the European Union and beyond, including facilitating discussion and sharing of knowledge and experiences with regards to the regulation of renewable fuels, such as issues relating to the implementation of the various directives related to biofuels. On behalf of the Renewable Fuels Regulators Club and its member organisations, we would like to thank the Finnish Energy Authority for maintaining and developing our network during the past two years (Oct 2015-Sept 2017). Frequent meetings, ongoing relationship management with key stakeholders such as the European Commission and Voluntary Schemes representatives, as well as coordinated initiatives like ongoing working groups, additional mini meetings or numerous informal consultations between the participants demonstrate, that our members continue to work towards the goal of an internationally sustainable renewable fuels industry, and that REFUREC can be considered as one of the required tools to make this a reality. With organisations from 26 countries actively participating, we have matured into a successful network of biofuel sustainability regulators, and into a positive model of European co-operation. During the past two years, the Finnish Energy Authority has demonstrated a strong commitment for the club and put nothing but hard work into this project in order to maintain and develop REFUREC. We cannot thank Finland enough for their support of this important network. We all have very much appreciated this opportunity given and will look back to two very positive, fruitful and output-driven years lead by two highly skilled individuals.